Here I am again, at Earl's. Now you might be wondering why I am subjecting myself to generic, underwhelming and generally expensive chain restaurant food? Well, there are a few reasons. First of all, Ma had $100.00 worth of gift cards to spend and I was actually moderately pleased with my food the last time at Earl's. After all, it's really hard to turn down free food! Initially, Ma joked that we would not need to use all of the gift cards for our meal. However, with 3 of us and knowing full well of Earl's pricing, I was pretty confident we'd spend it all. On that note, it is increasingly difficult to find reasonable pricing at places like Milestone's, Cactus Club, Joey's, Moxies and Earl's these days. It seems that you can't get out of there without spending at least $20.00 per person. However, I can understand this from a business point of view. The operating costs in terms of food, staff, rent and the such need to be covered. Hey, when I was in University, most people I hung out with would regularly eat at these places without hesitation. Once again, these types of chain restaurants serve a purpose and usually do it quite well. 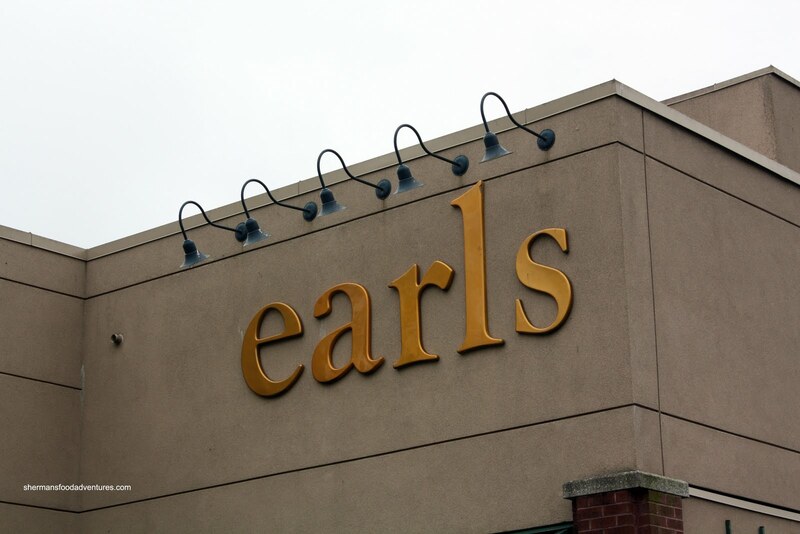 So off we headed over to the Strawberry Hill location and it looked pretty much like any other Earl's. Again, the familiarity and consistency are real draws for some people. And yes, the "staff" were pretty much consistent as well. Let's just say the food ain't the only attraction here, at least for some people. 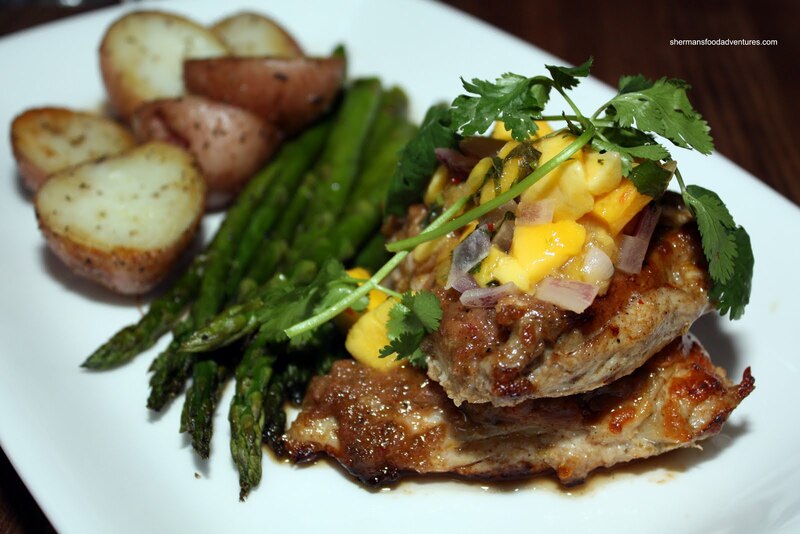 We started off with the Dry Ribs, which seems to be a staple of most menus these days. 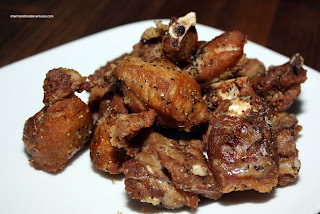 Fried, tossed in salt and fresh cracked pepper, these ribs were good. Crispy on the outside while still moist on the inside, the only thing the ribs needed was more salt. For myself, I decided to go for the Prawn & Scallop Linguine. 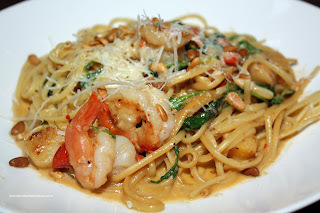 Prepared with a citrus white wine cream sauce with scallops, prawns, grape tomatoes, basil, arugula, toasted pine nuts and grated Parmesan, it was quite good. The pasta itself was slightly on the softer side; but not extremely so. It did soak up all of the flavour from the sauce and I found it balanced without being too creamy. Ma had the Certified Angus Beef Top Sirloin Sandwich which consists of 5oz sliced sirloin, sauteed onions, lettuce, tomato, mayonnaise and Dijon mustard on ciabatta. 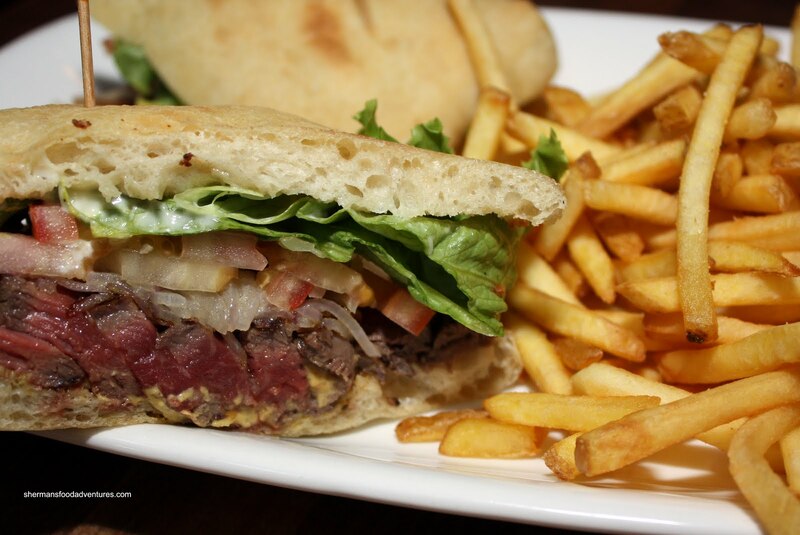 The good thing about the sandwich was the perfectly cooked steak (rare). T he bad thing was that it was chewy and tough. That was quite peculiar since technically the steak should have been tender despite its rareness since it's not a fatty cut. Otherwise, Ma enjoyed the flavours and thought it was pretty good. 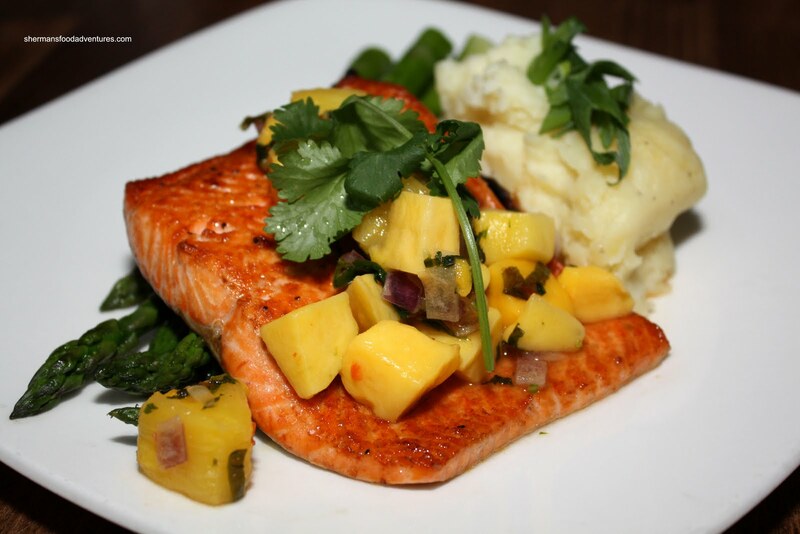 Another dish at our table was the Cedar Planked Salmon which was served with a tropical fruit salsa consisting of chopped pineapple, mango, red onions, fresh cilantro and mint. Also on the plate were garlic butter fingerling mashed potatoes and asparagus. The salmon was cooked perfectly where it was just beyond uncooked and the salsa was a nice fruity addition. The last dish was the Jamaican Jerk Oven Roasted Chicken which consisted of 2 boneless pieces of jerk marinaded chicken topped with a mango and pineapple salsa. Roasted fingerling potatoes and asparagus rounded out the dish. The jerk spices were quite mild while the chicken itself was quite tender. Nothing remarkable about the dish; yet nothing bad about it either. I must admit, this visit to Earl's was actually quite good. I was impressed with the decent portion sizes and the level of execution. I guess this time around, I got to sample the more "expensive" entrees unlike last time. The fact that everything was pretty good, albeit not cheap, may have softened my stance on Earl's. Just fyi, the salmon looks like it comes with mashed potatos. I love eating at Joeys, but it's so ridiculously expensive on a student budget. Le sigh... less make up, more food? Thanks justpattiez. Darn, what an omission of one word can do to description eh. What I meant was garlic fingerling mashed potatoes... LOL... I need an editor!